In this month’s blog, we’ll be focusing on cockroach pest control. Bug Authority provides cockroach control and treatment in Nashville, Franklin, Brentwood, Spring Hill and cities throughout Middle, Tennessee. It’s cold in Tennessee! Single-digit temperatures are driving people inside where they can get warm. The cold winter temperatures are driving insects inside too! When the weather turns cold, insects like cockroaches start looking for places where they can find warmth and over-winter. And guess what. 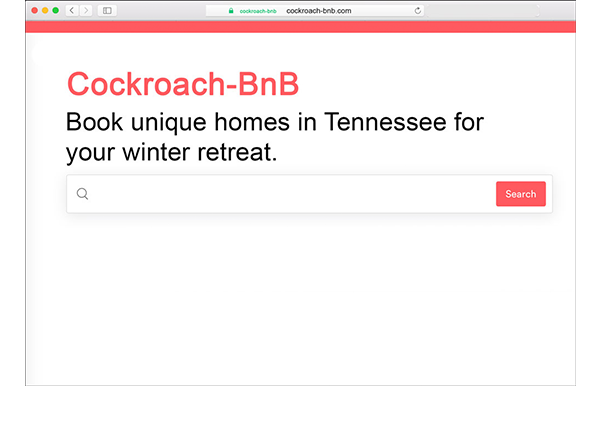 You may be surprised to learn that your house is listed on www.cockroach-bnb.com as a perfect place to spend the winter! Cockroaches can “check-in” by wiggling into cracks in siding, crawling under doors, crawling through pipes, coming in through the garage, etc. They crawl into the walls where they make their nests, hoping to be out of sight and out of mind until things warm up in the spring. Just when they have settled down for a long winter’s nap, your heater comes on and warms up your house. The cockroaches think spring has sprung and they wake up. The next order of business is finding food, and that’s when you might start to see them. If you don’t have a cockroach pest control company like Bug Authority treating your home you could be in for some unwanted company. They instinctively know that they should hide and not come out until it’s dark to search for food. If you are one of those people who raid the refrigerator at night, you might see them scurrying for cover when you turn the light on in the kitchen. If you’re not a midnight raider, you might see other signs, such as roach droppings. When you see the signs, take action to evict them from their winter resort. Contact Bug Authority today! The experts in cockroach pest control at Bug Authority know how to find all of the cracks and crevices roaches can use to get inside and the places where they hide. They can provide the right cockroach treatment to get rid of cockroaches and prevent their return. Bug Authority also specializes in general Franklin pest control, Nashville termite inspections, bed bugs and brown recluse spiders. We service Nashville, Franklin, Brentwood, Spring Hill and surrounding areas in middle Tennessee.